“Small-scale Multifunctional Care Home” is a community-based care facility that offers a free combination of one-day visit, overnight stay and visit to home. They provide strong support for the caregivers at home and whom they care for. Day Visit: Time and day of the week can be customized. Services are available for necessary matters at necessary timing including urgent cases. Visit At Home: You can request when and how long to visit and what services to receive. Necessary service offered at necessary times. The visiting staff is whom the users know well. Why not incorporate this system into your caregiving at home? You can lead your own way of caregiving without becoming passive. 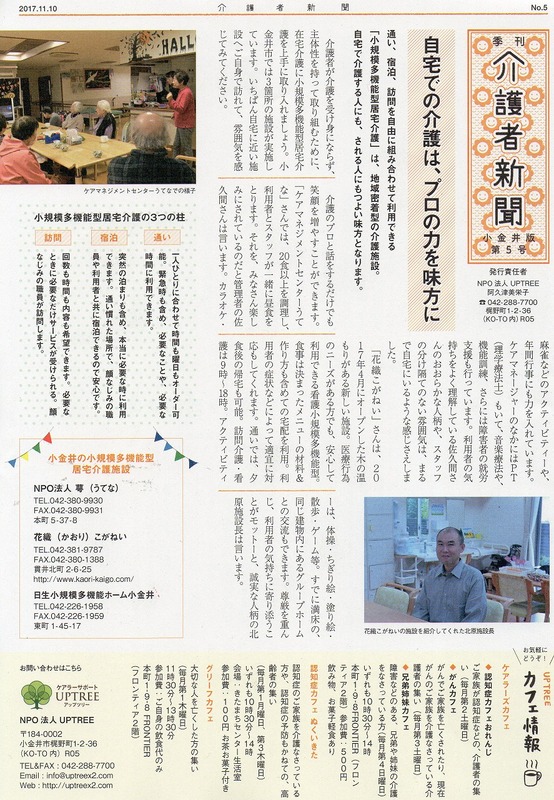 There are three facilities in Koganei City which offers the “Small-scale Multifunctional Care Home”. Please visit the facility nearest to your home and feel the atmosphere. Talking to the caregiving professionals will definitely bring you more smiles. “Care Management Center Utena” cooks more than 20 meals. Users and staff take lunch together. “Everyone looks forward to lunch,” says Mr. Sakuma, the representative. Activities such as karaoke and mahjong and seasonal events are their key features too. There is a physical therapist among care managers. Music therapy and functional training are offered as well as support for disabled job seekers. Mr. Sakuma’s generous personality and understanding for the users’ feeling as well as the fair and equal atmosphere among the staff make you feel at home. “Kaori Koganei” is a new facility with the warmth of wood, which opened in April 2017. It is a nursing small-scale multifunctional facility where users in need of medical practice can rely on. Meals are based on the delivery set menu with set ingredients and recipe. Their services are provided according to the symptoms of users. In a day visit, it is possible for the users to go home after dinner. Visiting caregiving and nursing are offered from 9 to 18. Activities include exercise, torn-paper picture, coloring, walking and games. Users can intermingle with the residents of the group home inside the same building, which is already full. Mr. Kitahara, the head of the facility says that their motto is to respect the dignity and stay close to the feelings of the users. Venue: FRONTIER, a café near Musashi-koganei Station, South Exit. Please come along and join! Please contact UPTREE if you would like to join or have any questions. © Copyright 2019 UPTREE All rights reserved.